An expert forecast China's international trade will remain robust in the next half year, and its continued efforts to increase imports will meet domestic demand and shore up the world economy. "The country's foreign trade volume has picked up steadily and is facing fresh opportunities. In the second half year, trade is expected to maintain solid growth," said Liang Ming, director of the institute of international trade at the Chinese Academy of International Trade and Economic Cooperation. "Increased efforts are essential to further liberalize and facilitate trade and investment, as well as to help maintain the multilateral trading system," Liang said. "While stabilizing exports, we need to enlarge imports. … Foreign trade can be developed in a balanced manner." Official data show the nation's international trade maintained steady growth so far this year. In the first five months of 2018, trade in goods surged 8.8 percent year-on-year to 11.63 trillion yuan ($1.79 trillion), according to the General Administration of Customs. 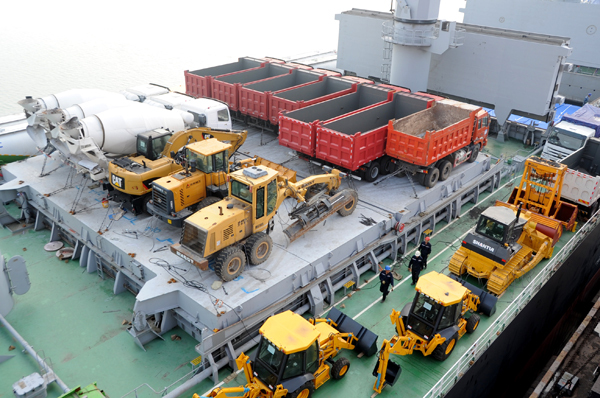 Imports grew faster than exports between January and May, resulting in a trade surplus of 649.8 billion yuan, which narrowed 31 percent year-on-year, the data show. "The robust trade growth can be attributed to many factors," Liang said, citing the steady recovery of the global economy, noticeable strong growth of international trade and sustained domestic demand. A Ministry of Commerce report released in May also predicted an upward trend in trade. The report forecast China's total trade volume would remain robust throughout the whole year, after getting off to a strong start.